...on our favourite Fred Olsen ship, the "Braemar". This is fully reported on this link. ...on the Fred Olsen ship, "Black Watch". This is fully reported on this link. A week early, perhaps & he paid for it. 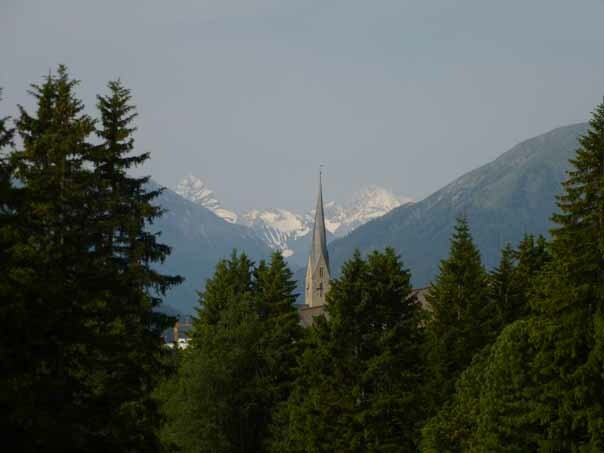 After taking the Eurostar to Paris & the TGV to Basel, he stayed the night, continung on to Lavin in the Engadine (Inn Valley), the next day, having got up early, so as to start walking at 10:00. 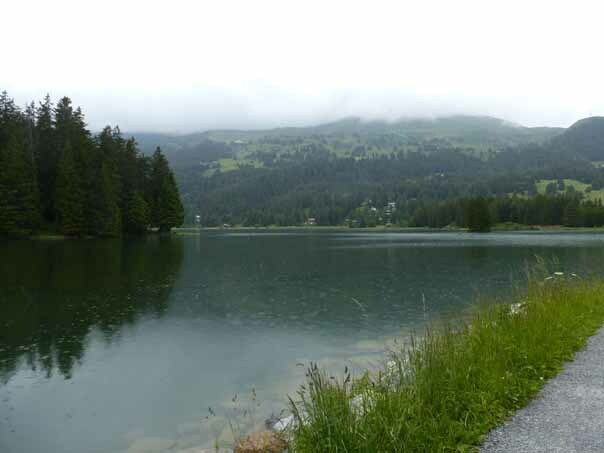 The weather was clearly not the best & the planned walk over the Vereina Pass to Klosters, absolutely not on. 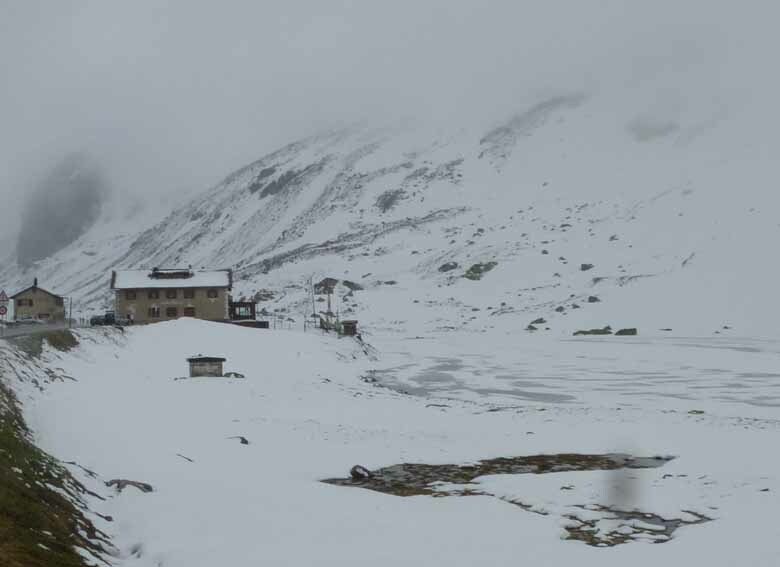 However, there is a road pass over to Davos, the Fluela Pass & these are usually safe in poor weather. This is all shown on this link. The next day, he tried to get over the pass system to Arosa. This is a bit complicated & he nearly got up to the Strela Pass (where you have to turn left, i.e. South) but it was snowing really hard & the way ahead was all blank snowfields, so he turned back to Davos & stayed in the Hotel Dischma for that night. The next day, of course, had to be glorious but Ken did not feel like going back up & set off South for Tiefencastel, not knowing how far it was until he saw a road sign. 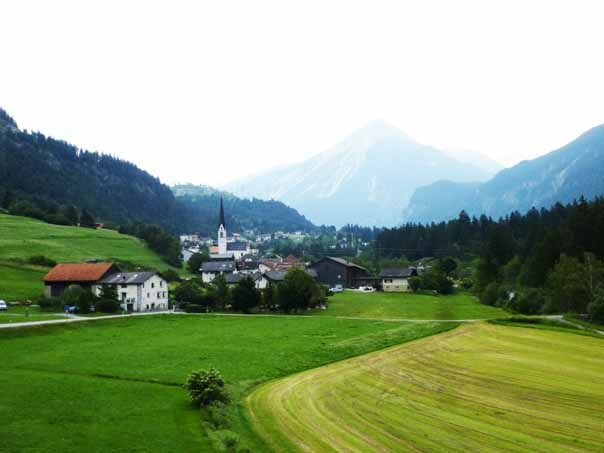 It was rather too far but he kept on past the other Davos villages. Top of the Fluela Pass. Food available! 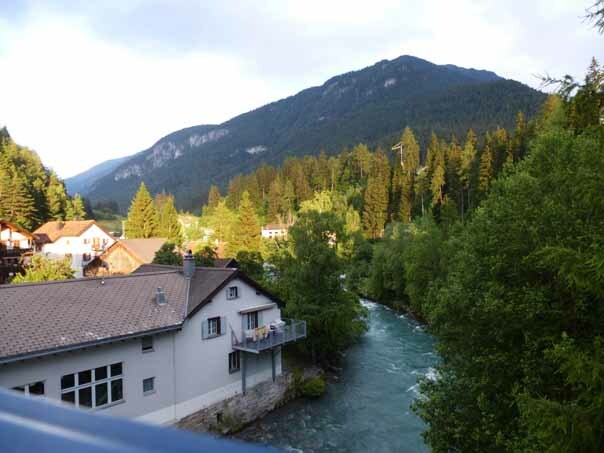 When he got to the Landwasser Tunnel & not having a map (there is a path round it), he was soon offered a lift to Alvaneu, where the other pass from Arosa comes out but opted to keep walking past Surava to Tiefencastel, where he had a needed rest day. 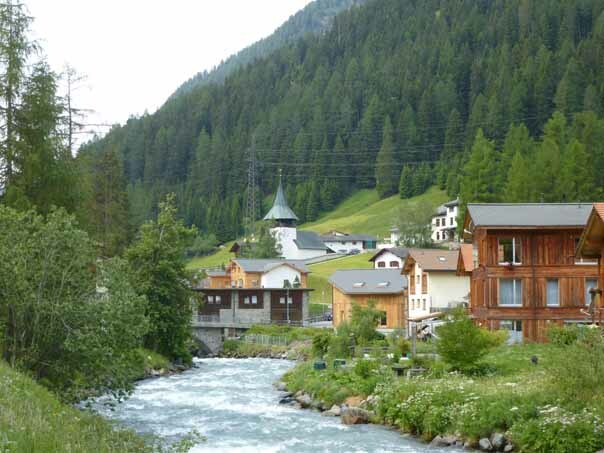 He stayed in the Hotel Albula & Julier, the two passes that come down here. Then, to make a proper tour of it & to explore Lenzerheide, where he had not been before, he set off up onto the heath (heide). 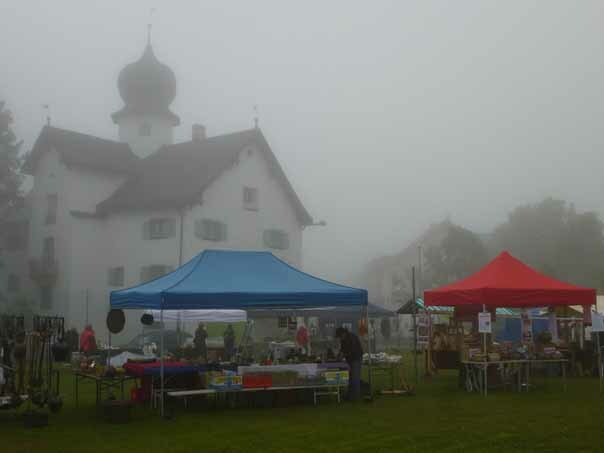 Lenz was a bit of a dump but with an interesting church. 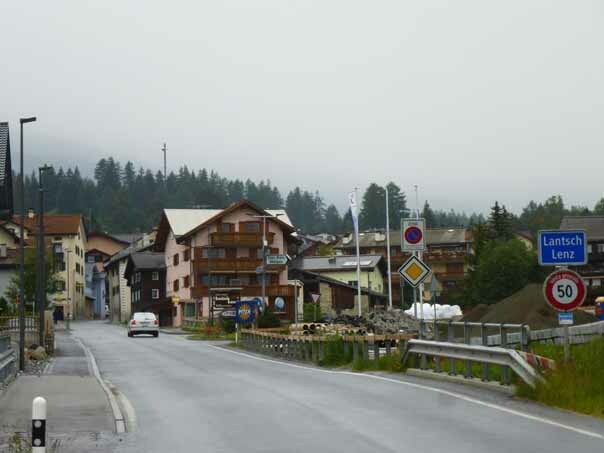 Ken plodded on in increasing rain, which only let up in Lenzerheide, essentially a ski village (much bigger than Lenz) & a dormitary suburb for Chur. 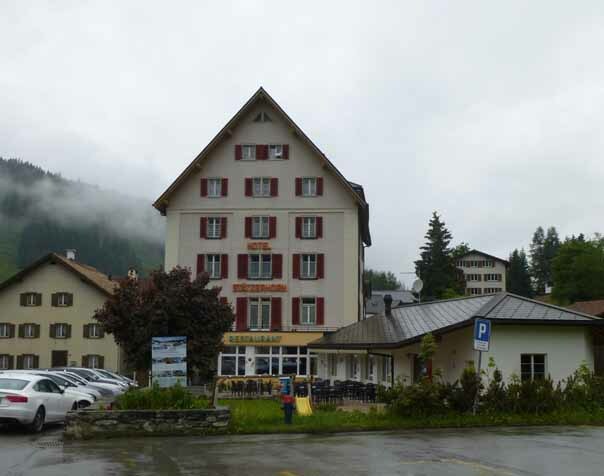 He stopped overnight in the Hotel Stutzerhorn in Parpan, just over the pass, where the locals (it was the pub) made him very welcome. 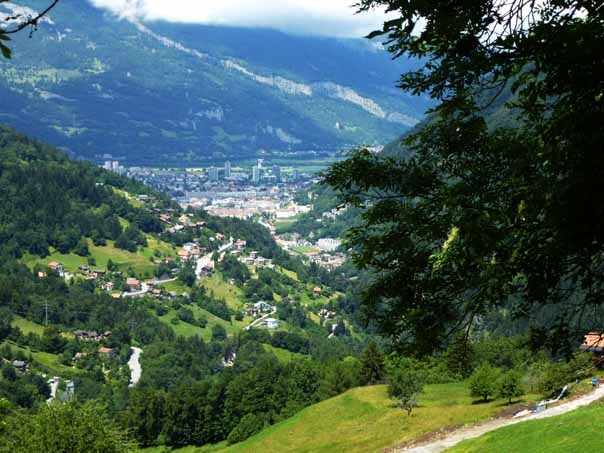 After a look at the Sunday Market, he set off down the East side of the valley towards Chur, the target for the tour & a major city. 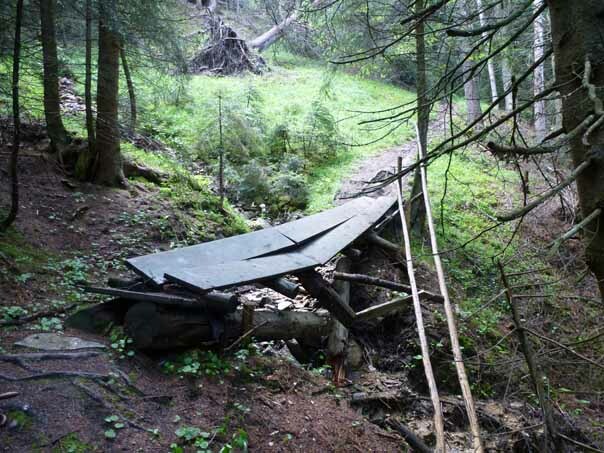 This path was well away from the road but a bridge broke as he crossed it, precipitating him into the woods, not fortunately, the stream or he would have been very dirty. He stayed overnight in the Hotel Post, which he has used before, then went to Basel for the 1st look round for 39 years. Not a lot has changed. Home next day, stopping in Strasbourg for a superb lunch. This is fully reported on this link. This page's URL: http://www.art-science.com/Xmas2013/travel.html Last revised 1/12/2013 Copyright: ©Ken Baldry 2013 All rights reserved but print it off if you want to.